When you hear someone sneeze, what do you do? Back away? Move closer? Most of us wouldn’t move closer because we know that there could be contagious germs coming from that sneeze, and that we could catch them. But what if I told you that our emotions tend to be even more contagious than any sneeze germs? That whether we intend to or not, we are constantly sending and receiving emotional messages, and catching each other’s emotions. It’s an effect known as emotional contagion. This phenomenon illustrates the importance of being aware of and managing emotions – of practicing emotional intelligence. Because as we’ll see, emotions spread through a number of mechanisms, most of which we’re not even aware of as they are happening. And the better we understand how emotional contagion works, the more we can make it work for us. Let’s take a look at the science behind it all. To understand the phenomenon of emotional contagion, it helps to understand the basics about emotions. What’s the purpose of emotions? They serve to focus our attention and motivate us to action in a way that helps us survive and thrive. They provide information about our interior world and about our relationships. And for this survival function to operate optimally, we are highly sensitive to emotional signals in the environment. One person’s emotions are affected by others’. Just as herd animals would benefit from rapidly passing messages about risk and reward, emotional contagion seems to be adaptive for humans to function in groups. This system can enable a rapid communication of opportunity and risk, mediate a group interaction, and help humans attend to social rules and norms such as maintaining harmonious interaction with a powerful ally. This sensitivity, this process of catching others’ emotional states, is known as emotional contagion. And research has found that emotional contagion happens through a number of mechanisms – maybe because the quicker we can get and understand this valuable emotional data, the better. Studies of mood and human behavior have shown that feelings spread from one person to another through a number of mechanisms. Non-verbal communication cues, including facial expressions, posture, and specific behavioral patterns, have also been linked to the transmission of emotional data between people. This matches up with my own experience. Growing up, my dad (who was a loving, caring father) had a tendency when he was angry to be completely silent – but I could still feel his emotional state by the way he looked, the tightness of his facial muscles, and the way he walked. This is important to keep in mind: we’re all transmitting emotional data, and others are often catching it, even if we don’t intend to. Silently sulking in our own misery doesn’t actually spare others in the way we think that it does. Emotions spread in many ways. 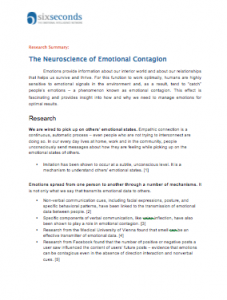 Emotional contagion can occur through a number of mechanisms, which often work in tandem but don’t have to, as evidenced by the study from Facebook. But considering this, how does emotional contagion play out in groups? Sigal Barsade’s experiments at Yale University provide amazing insight into the role of emotional contagion in groups, especially when it’s the leader’s emotions, and the impact that the group’s mood has on performance. In Barsade’s experiments at Yale, a trained actor was placed within group contexts and directed to participate in the groups’ activities while enacting varying levels of pleasantness and energy. The groups were working to assign a pay bonus; they had a fixed amount of money they could spend and had to allocate it based on a set of performance criteria. After the activities were completed, participants were asked to complete self-assessments of their mood. Results of the study clearly suggested that the effect of one group member’s emotions had an unconscious affect on the mood of the other group members. This held true both for “positive” and “negative” moods . Given that mood is contagious, one important consideration is the effect of mood on performance. Some authors focus on the idea that “positive” moods have a positive effect on performance, but in reality sometimes a “negative” mood is appropriate. In the Barsade study discussed above, a negative group member seemed to disrupt the groups and reduce efficacy, while having a positive confederate was associated with increased cooperation, fewer group conflicts, and heightened task performance. Likewise, in a similar study, Alice Isen assessed radiologists, finding positive mood enhanced their accuracy. Positive mood has a far-reaching effect on work performance, supervision, decision-making, and even on team members voluntarily acting for the good of the organization . The evidence that an individual’s feelings affect others – and that these feelings in turn affect performance – illustrates the importance of being aware of and managing emotions, especially for leaders, educators, salespeople, parents, politicians, athletes – really any person concerned with their influence on others. One challenge is that this emotional exchange can occur without conscious attention. In other words, whether they know it or not, people are affecting others. If emotional intelligence allows people to monitor and manage this exchange, developing emotional intelligence will improve people’s ability to successfully interact with others. My current goal is to simply be more aware of my own emotional state and when I feel like I am catching others’ emotions. If you have any helpful tips for how to do that, please leave a comment as I am happy to learn from each other. If you are interested in learning more about emotional intelligence and how to improve yours, I recommend reading Get Started with Emotional Intelligence. It’s short, simple and powerful. Or to dive deeper into emotional contagion, download our white paper and free slides by clicking on the button below. Joshua Freedman is COO of Six Seconds – The Emotional Intelligence Network; he is the author of At the Heart of Leadership, the SEI Leadership Report, and the Organizational Vital Signs climate assessment. Neumann, R., & Strack, F. (2000). “Mood contagion”: The automatic transfer of mood between persons. Journal of Personality and Social Psychology, 79 (2), 211-223. Gallese, V. (2006). Intentional attunement: A neuropsychological perspective on social cognition and its disruption in autism. Brain Research, 1079. 15-24. Adam D. I. Kramer, Jamie E. Guillory and Jeffrey T. Hancock (2014). “Experimental evidence of massive-scale emotional contagion through social networks.” PNAS 2014 June, 111 (24). Barsade, S.G. (2002). The ripple effect: Emotional contagion and its influence on group behavior. Administrative Science Quarterly, 47 (4), 644-675. Barsade, S.G., & Gibson, D.E. (2007). Why does affect matter in organizations? Academy of Management Perspectives, 36-59. Elsbach, K., & Barr, P. (1999). Effects of mood on individuals’ use of structure decision protocols. Organization Science, 10 (2), 181-198. I would love to know how to protect myself against a moody coworker. I am aware of myself catching the mood and although I know conciously that this is happening, I can’t stop myself getting pulled down. I will also be much more aware now of my tendency to do ‘silent anger’ which is not helpful to my coworkers! This is such a fascinating article! It is so true that we absorb & sometimes react to the emotions of those around us. That’s why it is so important that we surround ourselves with optimistic thinkers & peaceful people. This article made me realize also how we react to body language, a concept I hadn’t really thought of before. Thanks Michael Miller & six seconds! Helpful tip when you feel like you are catching someones else emotions. Based on energy medicine emotions of others attach to the bio- energy field this can be either conscious or subconscious. Subconscious mostly goes unnoticed by the person its attached to. They can feel out of sorts and not even know why. TIP: Be aware of your own emotional state and if you notice it shifts without conscious reason you have most probably on a subtle level picked up others emotions energetically. In my field of work as a Bio-energy practitioner and teacher I find most commonly this can become a blockage for the person affected. When its sub-conscious the individual doesn’t know what to do about it and they may feel stuck or emotionally out of sorts. If this happens I recommend finding a certified ‘Life Alignment practitioner”to help identify the cause by bringing it to conscious awareness and balance the blockage. The practitioner will facilitate an empowering process through questioning to assist them on a conscious level on how to protect themselves. Facilitation can be done over long distance. You asked for tips and I think I have one to share. I would invite anyone interested to research Transference, Counter Transference and Projection. They tend to appear more in therapeutic models, though they have a great bearing on any form of relationship, such as coaching, education etc. It’s always so wonderful to see us move towards the understanding of interconnected humanity. Could you imagine how then wars and famine, poverty and negative indifference has changed our humanity. From the Holy Bible….”There is no faithfulness, no love, no acknowledgement of God in the land. There is only cursing, lying and murder, stealing and adultery, they break all bounds and bloodshed follows bloodshed. Because of this the land mourns, and all who live in it waste away; the beasts of the field and the birds of the air and the fish of the sea are dying.” Hosea 4:2-3, emphasis added….There has always been discussion on interconnections in Christianity.